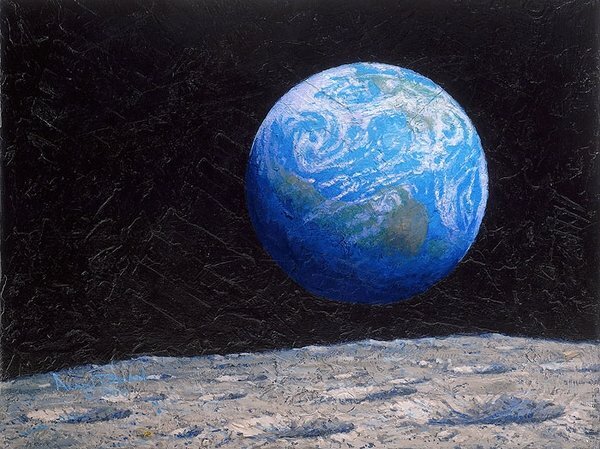 In "The Source of Intelligent Life," Alan Bean’s signature style comes alive in this special Textured Canvas Fine Art Edition. As an artist, Bean conveys the sense of space travel not only through subject and color but also texture. As an astronaut and moonwalker, he can use the tools that once used to explore the Moon to help him put the Moon’s stamp in and on his art. Prior to painting the image, Bean covers the surface on which he will work with a texturing material. He then uses exact replicas of his Moon boots to make footprints across this surface to replicate the Apollo boot prints remaining on the moon today. Next he uses the same geology hammer he worked with on the Apollo 12 mission to dig into the painting’s surface. Finally, a sharp edged bit from one of the core tubes is used to make round indentations in the surface. All of these come to amazing 3-dimensional life in this striking Fine Art Edition.